We reached and surpassed our $75,000 fundraising goals! Thank You for all that donated to the Collins Ferry Connector Fundraising Campaign. The Collins Ferry Connector Trail is a 1/2 mile trail linking the Suncrest and Collins Ferry Road neighborhoods to the Mon River Rail-Trail. 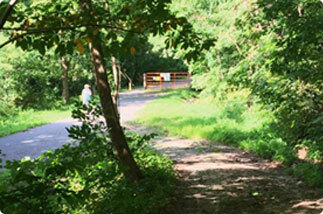 The wooded path, once the road right-of-way, goes from end of road down to the rail-trail. The connector trail will become a formal walk/bike right-of-way with the Department of Energy (NETL) and make the route easier and safer with new compacted stone surface, drainage improvements, and safety fencing. This is one of several neighborhood and downtown connections that the Mon River Trails Conservancy is currently working on to make Morgantown and Star City easier to walk and bike to destinations. MRTC hopes that the Collins Ferry Connector Trail will increase the trail use from Suncrest and Collins Ferry neighborhoods, increase bike commuting to work and more people walking on their lunch hours. It will also decrease the need for cars and parking lots to get to the rail-trail.